I'm so thrilled to have USA Today Bestselling Author, Rachel Bailey, on the blog today. Welcome, Rachel! I love where I live. It’s on the east coast of Australia, surrounded by trees, within driving distance to the beach. And one of my favourite parts of my place is my driveway. 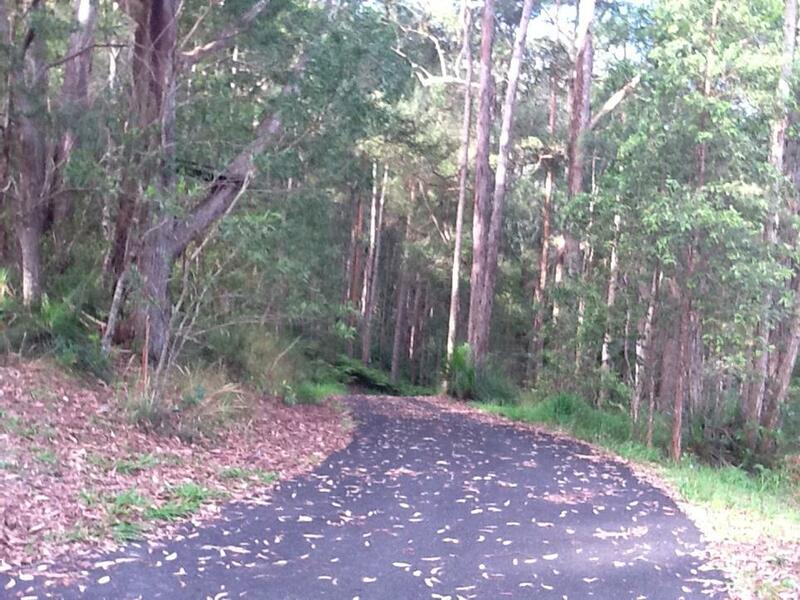 Sounds weird, I know, but it’s rimmed by gum trees and the black bitumen contrasts nicely with all the green. Twice a day, I take my four dogs out for a run and fresh air. 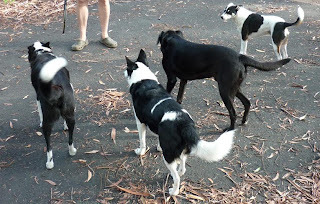 The Border Collies like to play tennis (balls bounce nicely on the hard, flat driveway) the other two dogs like to sniff around and look for animal trails. I think it’s important that everyone has a favourite spot where they live. Maybe it’s a shady corner in the back yard where they can read a book. Maybe it’s their bedroom that they’ve decorated in their favourite colours. Maybe it’s not at their house at all, but at a park down the road. When I’m writing a book, I always think about where the characters feel most at home, or where they love to escape to. For example, in Return of the Secret Heir, JT and Pia were high school sweethearts, so their favourite place was somewhere where they could be alone, ie., not at their own houses where their parents would be. Whenever they could, day or night, they would sneak away to a secluded beach and sit together in the trees that bordered the sand. It was *their* spot, and knowing that about them really helped me connect with their backstory. So, tell me, is there somewhere in your house or close by that you can escape to? Somewhere you feel at peace? I’ll give away a book from my backlist (winner’s choice) to a random commenter who tells me their favourite part of where they live. Rachel Bailey developed a serious book addiction at a young age (via Peter Rabbit and Jemima Puddle-Duck) and has never recovered. Just how she likes it. She went on to gain degrees in psychology and social work but is now living her dream—writing romance for a living. She lives on a piece of paradise on Australia’s east coast with her hero and four dogs, and loves to sit with a dog or two, overlooking the trees and read books from her ever-growing to-be-read pile. He's returned for a fortune and is confronted by memories. Though tycoon JT Hartley is a success in his own right, he's set on claiming his share of his late father's legacy. But first he has to get past the estate executor - none other than Pia Baxter, a woman he's never forgotten. Theirs had been a fast-and-furious union that ended all too suddenly. And though desire still courses between them, JT knows starting anything with Pia again is just asking for trouble. His future is set in stone. But even the best-laid plans are no match for true passion. Lacey, I agree with you! Lacey, driveway envy isn't something I'd ever thought I'd inspire in someone either! Lol. 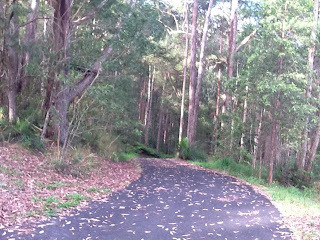 Romance Reader, before you get too jealous, I should say that another advantage of my driveway is it gives me a clear path to walk through the trees, ie., a little bit safer from the deadly snakes and spiders. Definite downside of living among the trees in Australia. But I wouldn't swap it! You live in a beautiful spot, Rachel. But Eww! on the spiders. It's fall in my part of the world, our best season I think. Too many bugs in the summer. Anne, I'd love to see a northern fall. Here we only call it autumn and the leaves don't change much (except on a rare tree, and the imports). I love autumn, but I think it would be something special in the north of the globe! Lovely to read aout you, Rachel and your special spot. And the photos are so lovely. Thanks for sharing. Congrats on the release of RETURN OF TEHSECRET HEIR! Hi Rachel and gorgeous canines! Definitely a driveway to be appreciated :-) My little piece of paradise at home is looking out at the beautiful native bush that makes up our back yard. I love all the bird life (no dangerous creepy crawlies!) and - this may seem strange - but the smell after the rain (a frequent occurrence in Auckland) is just magical - fresh and earthy! Yet we're so close to town. Fabulous place for our doggie in her twilight years to sniff and explore at a leisurely pace too. Hi Rachel - waving at you from NZ where I'm very pleased about not having snakes. The book sounds fabulous. I like to slip away to the cafe overlooking the beach near me, to have a break with a good romance book, a slice of something yummy, and a latte. Perhaps my next escape will be with your book! My secret place is the beautiful Megalong Valley in the Blue Mountains NSW, Australia. You drive down a winding road from the top of the ridge at Blackheath, through subtropical rainforest of giant tree ferns, until you reach the bottom of the escarpment. There the land is cleared for farms, the odd tea house, and horse-riding getaways. You look up and see the ancient sandstone cliffs that turn gold in the setting sun. You have to be careful driving because wallabies bound out of the bush, especially at dusk, when the odd wombat also tries to cross. At road's end are walking tracks that lead through the wilderness, even one that leads up to Katoomba, where visitors see the famous Three Sisters at Echo Point. Clare, I love the smell after rain too! Fresh and earthy is the perfect description. Happy sigh. Bron, waving back to you in NZ! I remember the first time I visited NZ and (naive as I was) I was truly surprised that none of your fauna wanted to kill me. It's such a way of life here, esp outside the cities, to be aware. Oh my, Elizabeth! I've never been to the Blue Mountains, but I've flown over them and looked down at the gorgeous landscape. Your description makes it sound truly magical. We have a lot of wallabies here (the dogs try to keep them away from the house) but no wombats. I'd love to have a wombat nearby! Terrific post, Lacey and Rachel. Rachel - what a lovely driveway. I'm lucky to live in Scotland - gorgeous hills, serene lochs and, my favourite, wild and windswept coastlines. Talli, you know, before I moved to this house I would never have considered a driveway could be anything more than a way to get the car to the garage. Now I love it!